Bob: Weren't you in the news? Some show in, Prayge... Prague? Edna: Milan, darling. Milan. Supermodels. Heh! Nothing super about them... spoiled, stupid little stick figures with poofy lips who think only about themselves. Feh! I used to design for gods! Honey: 'Greater good?' I am your wife! I'm the greatest good you are ever gonna get! Syndrome: [about his newest Omnidroid] It's bigger. It's badder. Ladies and gentlemen, it's too much for Mr. Incredible! Dash: [answers door] Hey, Lucius! Lucius: Hey, Speedo, Helen, Vi, Jack-Jack. Bob: Hey, hey! Ice of you to drop by. Lucius: Never heard that one before. Kari: [on phone message] Hi, this is Kari, sorry for freakin' out but your baby has special needs. Mr. Incredible: Is everybody okay back there? Violet: I feel different. Is different okay? Syndrome: Shhh. The baby's sleeping. Syndrome: Everything you weren't. And in time, who knows? He might make a good sidekick. Mirage: [through her teeth] Next time you gamble, bet your own life. Syndrome: You, sir, truly are Mr. Incredible. You know, I was right to idolize you? I always knew you were tough, but tricking the probe by hiding under the bones of another super? Oh, MAN! I'm still geeking out about it! Syndrome: And then you just had to go and ruin the ride. I mean, Mr. Incredible calling for help? Syndrome: Help me! Help me! Lame, lame, lame, lame, lame! Mr. Incredible: How could I betray the perfect woman? Elastigirl: Oh, you're referring to me now? Edna: Men at Robert's age are often unstable... prone to weakness. Edna: Do you know where he is? Mr. Incredible: Sometimes, I think I just like the simple life, you know, relax a little and raise a family. Mr. Incredible: [yelling to Helen as she holds up the RV] How ya doin', honey? Elastigirl: [screaming back] Do I have to answer? Helen: [sobbing] Now I'm losing him! What'll I do? What'll I do? Edna: Pull-yourself-together! "What will you do?" Is this a question? You will show him you remember that he is Mr. Incredible, and you will remind him who you are. Well, you know where he is. Go, confront the problem. Fight! Win! Edna: And call me when you get back, darling. I enjoy our visits. Mirage: A volcano? My employer is attracted to power. As am I. It's a weakness we both share. Mr. Incredible: Seems a little... unstable. Mirage: I prefer to think of it as misunderstood. Mr. Incredible: Aren't we all? Principal: Thank you for coming in, Mrs. Parr. Helen: What is this about? Has Dash done something wrong? Bernie Kropp: He's a disruptive influence and he openly mocks me in front of the class. Bernie Kropp: Look, I know it's you! He puts thumbtacks on my stool. Bernie Kropp: Well, not really... No, actually not. Helen: Oh. Then how do you know it was him? Bernie Kropp: I hid a camera. And this time I got him. Bernie Kropp: See? See? What, you don't see it? Bernie Kropp: He moves! Right there! Wait, wait... Right there! Right as I'm sitting down! I don't know, I don't know how he does it, but-but there's no tack on my stool before he moves, and after he moves, there's a tack! Coincidence? I think not! Bernie Kropp: Don't "Bernie" me! This little rat is guilty! Principal: You and your son can go now, Mrs. Parr. Bernie Kropp: You're letting him go again? He's guilty! You can see it in his smug little face. Guilty, I say! Guilty! Guilty! Mr. Incredible: What are you waiting for? Boy on Tricycle: I don't know. Something amazing, I guess. Mr. Incredible: [sighs] Me, too, kid. Helen: [on the phone] I'd like to speak to Edna, please. Helen: E? This is Helen. Helen: [nearly dropping the phone] Yes, yes, it's been a while. Listen, there's only one person who Bob would trust to patch a super suit, and that's you, E.
Edna: Yes, yes, marvelous suit, darling, much better than those horrible pajamas he used to wear. Edna: They're all finished, when are you coming to see? Edna: Don't make me beg, darling, I won't do it, you know! Helen: [trying to talk over Edna] Beg? Uh, no, I'm, I'm calling about a suit, about, about Bob's suit. I'm calling about Bob's suit! Edna: You come in one hour darling, I insist, okay? Okay, bye-bye. Newsreel Narrator: Under tremendous public pressure and the crippling financial burden of mounting lawsuits, the goverment quietly initiated the Superhero Relocation Program. Superheroes were granted amnesty from past actions under the promise to never again resume hero work. Where are they now? They are living among us. Average people, average citizens quietly and anonymously making the world a better place. Elastigirl: Now our kids are in danger? Mr. Incredible: Well, if you suspected danger, why'd you bring them? Elastigirl: I didn't bring them! They stowed away! And I don't think you're striking the proper tone here! Bob: It's okay, kids. We were just having a discussion. Bob: I was gonna say evil. Elastigirl: Stop it! We are not gonna die! Now, both of you will get a grip! Or so help me, I will ground you for a month. Understand? Bob: [to Buddy] You're not affiliated with me! Lucius: Superladies? They're always trying to tell you their secret identity... think it'll strengthen the relationship or something like that. I say, "Girl, I don't wanna know about your mild-mannered alter ego or anything like that. I mean, you tell me you're, uh... S-Super, Mega, Ultra Lightning Babe, that's alright with me. I'm good... I'm good. Bob: Want to catch a robber? Lucius: No. To tell you the truth, I'd rather go bowling. Look, what if we actually did what our wives think we're doing... just to shake things up? Edna: You need a new suit, that much is certain. Bob: A new suit? Well, where the heck am I gonna get a new suit? Edna: You can't! It's impossible! I'm far too busy, so ask me now before I can become sane. Bob: Wait? you want to make me a suit? Edna: You push too hard, darling! But I accept! Oliver Sansweet's Lawyer: Mr. Sansweet didn't asked to be saved. Mr. Sansweet didn't want to be saved. And the injuries received from Mr.Incredible's "actions," so-called, causes him daily pain. Bob: [lunging towards Sansweet] Hey, I saved your life! Oliver Sansweet: You didn't save my life, you ruined my death, that's what you did! Elastigirl: You're in charge until I get back, Violet. Gilbert Huph: Parr! You authorized payment on the Walker policy? Gilbert Huph: I don't care about their coverage, Bob! Don't tell me about their coverage! Tell me how you're keeping Insuricare in the black! Tell me how that's possible with you writing checks to every Harry Hardluck and Sally Sobstory that gives you a phone call! Rick Dicker: Someone's always in trouble. Rick Dicker: Yeah. Every time you say that, Bob, it means a month-and-a-half of trouble for me, and thousands of dollars of taxpayer money. We have to pay to keep the company quiet, pay damages, erase memories, relocate your family. Every single time it gets harder. Money, money, money money money... We can't keep doing this, Bob! We appreciate what you did in the old days, but those days are over. From now on, you're on your own. Mirage: There isn't much time. Mr. Incredible: No, there isn't. Mr. Incredible: In fact, there's no time at all. Mr. Incredible: Why are you here? How can you possibly bring me lower? What more can you take away from me? Mirage: [choking] Family... survived... the crash. They're here... on the island! Dash: Huh? Hey, hey Vi, c'mere, look, look it talks! There, that one. Dash: What do we do? Dash: Where are we going? Mr. Incredible: Let me guess. It became smart enough to wonder why it had to take orders. Mirage: We lost control, and now it's loose in the jungle, threatening our facility. We've had to evacuate all personnel for their own safety. Mr. Incredible: How am I going in? Mr. Incredible: You want me to shut it down without completely destroying it. Mirage: You are Mr. Incredible. Mirage: I've got to warn you. It's a learning robot. Every minute you spend fighting it only increases its knowledge of how to beat you. Bob: You want to do something for Dash, then let him actually compete. Let him go out for sports. Helen: I will not be made the enemy here, Bob. You know why we can't let Dash compete. Helen: This... is not... about you! Helen: [on the phone with an old friend] Snug, I'm calling in a solid you owe me. Mr. Incredible: The robot's in the financial district. Which exit do I take? Mr. Incredible: That'll take me downtown. I take Seventh, don't I? Mr. Incredible: Great, we missed it! Elastigirl: You asked me how to get there and I told you. Exit at Traction! Mr. Incredible: That'll take me downtown! Elastigirl: It's coming up, get in the right lane! Signal! Mr. Incredible: We don't exit at Traction! Elastigirl: YOU'RE GONNA MISS IT! Bob: Look, I performed a public service. You act like that's a bad thing. Helen: It is a bad thing, Bob! Uprooting our family again so that you can relive the glory days is a very bad thing! Bob: [Defensively] Reliving the glory days is better than pretending they never happened! Helen: Yes! They happened, but this; our family, is what's happening now, Bob! And you're missing this! I can't believe you don't want to go to your own son's graduation! Bob: It's not a graduation. He is moving from the fourth grade to the fifth grade. Bob: You want to do something for Dash? Well, let him actually compete! Let him go out for sports! Helen: I will not be made the enemy here! You know why we can't! Helen: [Growing in size looming over Bob] This is not - about - YOU! Bob: [Notices a disturbance] Alright, Dash. Come on out I know you're listening. Helen: Vi, you too, young lady. Bob: It's okay. Your mother and I were just having a discussion. Violet: A pretty loud discussion. Helen: we should all be in bed. Elasigirl: Now, I'll tell you what we're not gonna do. We're not gonna panic, we're not gonna die. Dash: [over her] You said, "Something's up with Mom, we have to find out what!" Dash: ...It was your idea, your idea-! Dash: ...100 percent, all yours, all the time idea! Elastigirl: Wait a minute, wait a minute! You left Jack-Jack alone? Dash: [over her] No, we got someone, Mom! Somebody great! We wouldn't do that! Violet: [over him] Do you think I'm totally irresponsible? Thanks a lot! Dash: Dad, that was so cool when you threw that car! Mr. Incredible: Not as cool as you running on water! Guard 1: Hey, stop talking! Guard 1: Hold it, freeze! Guard 2: What the-? They're Supers! Bob: E, I just need a patch job. For... sentimental reasons. Edna: Fine. I will also fix the hobo suit. Bob: You're the best of the best, E.
Edna: [Walking up stairs] Yes, I know, dahling. Syndrome: [during his fixed fight with the Omnidroid] Somebody needs to teach this hunk of metal... a few manners! Voice in crowd #1: The Supers have returned! Voice in crowd #2: Is that Fironic? Voice in crowd #3: Fironic? Voice in crowd #4: No, Fironic has a different outfit! Syndrome: This isn't the end of it! I will get your son eventually! I will get your son! Elastigirl: India-Golf-Niner-Niner transmitting in the blind guard, disengage, repeat, disengage. Mr. Incredible: No! Call off the missiles, I'll do anything! Elastigirl: Friendlies, at two-zero miles south-southwest of your position, angels ten, track east, disengage, over! Vi! You have to put a force field around the plane! Violet: But you said we weren't supposed to use our powers! Elastigirl: I know what I said! Listen to what I'm saying now! Disengage, repeat, disengage! Elastigirl: Violet! Mayday, mayday, India-Golf-Niner-Niner is buddy spiked! Abort, abort, there are children aboard, say again, there are children aboard this plane! Elastigirl: [shouts] Put a field around us, now! Violet: [frightened] But I've never done one that big before...! Elastigirl: Violet, do it NOW! Abort, abort, abort! Helen: I thought you'd be back by 11. Bob: I said I'd be back later. Helen: I assumed you'd be back later. If you came back at all, you'd be "back later". Bob: Well I'm back, okay? Elastigirl: Of course I have a secret identity. Can you see me in this at the, at the supermarket? Come on! Who'd want to go shopping as Elastigirl, know what I mean? Bob: [listening to radio] A fire! We're close! Yeah, baby! Mirage: The supers are not gone, Mr. Incredible. You're still here. You can still do great things. Or... you can listen to police scanners. Your choice. Syndrome: [after the plane is shot down] Oh, you'll get over it. I seem to recall you prefer to..."work alone." Mr. Incredible: Release me, now! Syndrome: I knew you couldn't do it. Even when you have nothing to lose! You're weak! And I've outgrown you. Syndrome: Too late! Fifteen years too late. Elastigirl: I mean, either he's in trouble, or he's going to be. Dash: That was the best vacation ever! I love our family. Bomb Voyage: [not French, but with an accent] IncrediBoy? Buddy: Hey, hey! Aren't you curious about how I get around so fast? See? I have these rocket boots! Bomb Voyage: [French] Little oaf. Buddy: You always, always say "Be true to yourself," but you never say which part of yourself to be true to! Well, I finally figured out who I am: I am your ward. IncrediBoy! Buddy: I can fly! Can you fly? Bomb Voyage: [French] And your outfit is totally ridiculous! Helen: E, it's great to see you, but I gotta tell you, I've got no idea what you're talking about. Edna: Yes, words are useless! Gobble-gobble-gobble-gobble-gobble! Too much of it, darling, too much! That is why I show you my work! That is why you are here! Oliver Sansweet: [Mr. Incredible intercepts him on his way down and his momentum carries them both through the window of the building] Ow! I think you broke something. Mr. Incredible: Well, with counseling, I think you'll come to forgive me. Dash: Mom, you're making weird faces again. Bob: [not looking up from the paper] You make weird faces, honey. Elastigirl: I think your father is in trouble. Violet: If you haven't noticed, Mom, we're not doin' so hot either. Syndrome: Oh, come on! You gotta admit this is cool! Just like a movie! The robot will emerge dramatically, do some damage, throw some screaming people, and just when all hope is lost, Syndrome will save the day! I'll be a bigger hero than you ever were! Dash: Hey! No force fields! Helen: Dash... this is the third time this year you've been sent to the office. We need to find a better outlet. A more... constructive outlet. Helen: Honey, you know why we can't do that. Dash: But I promise I'll slow up. I'll only be the best by a tiny bit. Helen: Dashiell Robert Parr, you are an incredibly competitive boy, and a bit of a show-off. The last thing you need is temptation. Syndrome: Oh - and got biz-zay! It's a whole family of supers! Looks like I hit the jackpot! Oh, this is just too good! Mr. Incredible: [after he's thrown his ex-boss through several walls] I'm fired, aren't I? Rick Dicker: [sarcastically] Oh, you think? Frozone: Just like old times, huh Bob? Mr. Incredible: [slapping him in the back] Just like old times. Frozone: Ha-ha, yeah. Hurt then, too. Ow. Bob: [whispering] Listen closely. I'd like to help you but I can't. I'd like to tell you to take a copy of your policy to Norma Wilcox on... Norma Wilcox, W-I-L-C-O-X... on the third floor, but I can't. Bob: I also do not advise you to fill out and file a WS2475 form with our legal department on the second floor. I would not expect someone to get back to you quickly to resolve the matter. I'd like to help, but there's nothing I can do. Mr. Incredible: No matter how many times you save the world, it always manages to get back in jeopardy again. Sometimes I just want it to stay saved! You know, for a little bit? I feel like the maid; I just cleaned up this mess! Can we keep it clean for... for ten minutes! Elastigirl: Put these on. Your identity is your most valuable possession. Protect it. And if anything goes wrong, use your powers. Elastigirl: I know what I said! Gilbert Huph: Look at me when I'm talking to you, Parr! Bob: [looking out the window] That man out there, he needs help! Gilbert Huph: Do not change the subject, Bob! We're discussing your attitude! Bob: He is getting mugged! Gilbert Huph: Well let's hope we don't cover him! Bob: [leaving] I'll be right back. Gilbert Huph: Stop right now, or you're fired! Gilbert Huph: Close the door. Gilbert Huph: Get over here now. Gilbert Huph: I'm not happy, Bob. Not happy. Bob: [glancing out the window] He got away. Bob: [shouts loudly] I'm sorry ma'am, I know you're upset. Bob: Pretend to be upset. Rick Dicker: We've frozen all of Syndrome's assets. If he even sneezes, we'll be there with a hanky and a pair of handcuffs. Edna: Your boy's suit I designed to withstand enormous friction without heating up or wearing out, a useful feature. Your daughter's suit was tricky, but I finally created a sturdy material that can disappear completely as she does. Your suit can stretch as far as you can without injuring yourself, and still retain its shape. Virtually indestructible, yet it breathes like Egyptian cotton. Dash: She would be eating if we were having Tony loaf. Helen: Both of you sit down! Helen: [grabs Dash and puts him on his seat] You sit down! Helen: You sit down! Violet! Bob: Bob! It's time to engage! Do something! Don't just stand there, I need you to... intervene! Bob: You want me to intervene? Bob: Okay, I'm intervening! I'm intervening! Violet: [interrupting] Normal? What do you know about normal? What does anyone in this family know about normal? Violet: We act normal, mom! I want to be normal! The only normal one is Jack-Jack, and he's not even toilet trained! Dash: Uh, I meant about being normal. Lucius: [Bob and Lucius are sitting in a parked car, reminiscing] So now I'm in deep trouble. I mean, one more jolt of this death ray and I'm an epitaph. Somehow I manage to find cover and what does Baron von Ruthless do? Bob: [laughing] He starts monologuing. Lucius: He starts monologuing! He starts like, this prepared speech about how feeble I am compared to him, how inevitable my defeat is, how the world will soon be his, yadda yadda yadda. Lucius: Yammering! I mean, the guy has me on a platter and he won't shut up! Old Man #1: Ya see that? That's the way to do it. That's old school. Old Man #2: Yeah. No school like the old school. Mr. Incredible: Wait here and stay hidden. I'm going in. Elastigirl: While what? I watch helplessly from the sidelines? I don't think so. Mr. Incredible: I'm asking you to wait with the kids. Elastigirl: And I'm telling you, not a chance. You're my husband, I'm with you - for better or worse. Mr. Incredible: I have to do this alone. Elastigirl: What is this to you? Playtime? Elastigirl: So you can be Mr. 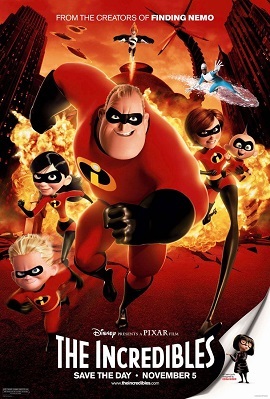 Incredible again? Helen: I love you, but if we're going to make this work, you have to be more than Mr. Incredible. You know that, don't you? Priest: ...so long as you both shall live? Syndrome: [Slams Mr. Incredible against the ground] Am I good enough now? Boy on Tricycle: That was totally wicked! Syndrome: Whoa, whoa, whoa. Time out! Dash: Does this mean we have to move again? Helen: You're late. When you asked me if I was doing anything later, I didn't realize you'd actually forgotten. I thought it was playful banter. Helen: Cutting it kinda close, don't ya think? Bob: You need to be more... flexible. Mr. Incredible: Are you doing anything later? Lucius: It means it's hot! And I'm dehydrated, Bob! Bob: You're out of ice? You can't run out of ice! I thought you could use the water in the air! Lucius: There is no water in the air! What's your excuse, running out of muscle? Bob: I can't just go smashing through walls! The building's getting weaker by the second, it's going to come down on top of us! Elastigirl: If it means land, yes. Bob: Did I do something illegal? Gilbert Huph: [pacing back and forth] The law requires that I answer no. Bob: We're supposed to help people! Gilbert Huph: We're supposed to help our people! Starting with our stockholders, Bob! Who's helping them out, Huh? Dash: Look, I'm The Dash. The Dash likes. Yeah-hah. Bob: Well, what are you waiting for? Little Boy on Tricycle: I don't know. Something amazing, I guess. Lucius: We look like bad guys. Incompetent bad guys! Elastigirl: Settle down, are you kidding? I'm at the top of my game! I'm right up there with the big dogs! Girls, come on. Leave the saving of the world to the men? I don't think so. Edna: This is a hobo suit, darling. You can't be seen in this. I won't allow it. Fifteen years ago, maybe, but now? Feh! Bob: Wait, what do you mean? You designed it. Edna: I never look back, darling! It distracts from the now. Kari: I also brought Mozart to play while he sleeps to make him smarter because leading experts say Mozart makes babies smarter. Kari: ...And the beauty part is the babies don't even have to listen 'cause they're asleep! You know, I wish my parents played Mozart when I slept because half the time I don't even know what the heck anyone's talking about! Elastigirl: Kari, I really don't feel comfortable with this. I'll pay you for your trouble but I'd really rather call a service. Kari: Oh, there's really no need, Mrs. Parr. I can totally handle anything this baby can dish out. Kari: Can't I, little baby? Who can handle it? Who can handle it? Dash: We're dead! We're dead! We survived but we're dead! Henchman: Every time they run, we take a shot! Helen: [on getting no response from the island's air tower, Helen reaches for her superhero costume, then pulls back] Easy, Helen, easy, easy girl. You're overreacting, everything's fine, they're just... all getting coffee! At the same time. Yeah. Syndrome: It's finally ready! You know, I went through quite a few supers to make it worthy to fight you, but man, it wasn't good enough! After you trashed the last one, I had to make some major modifications. Sure, it was difficult, but you are worth it. I mean, after all... I am your biggest fan. Mr. Incredible: [recognizing that last line] Buddy? Syndrome: My name is not Buddy! And it's not Incrediboy, either. That ship has sailed. All I wanted was to help you. I only wanted to help, and what do you say to me? Mr. Incredible: [Flashback] Fly home, Buddy. I work alone. Syndrome: It tore me apart. But I learned an important lesson. You can't count on anyone, especially your heroes. Mr. Incredible: [Everyone is trapped in Syndrome's containment unit] I'm sorry. I've been a lousy father, blind to what I have. So obsessed with being undervalued that I undervalued all of you. Violet: [At the control panel] Well, I think dad has made some excellent progress today, but I think it's time we wind down now. Buddy: Oh, no, no, you don't have to worry about training me! I know all your moves, your crime-fighting style, favorite catchphrases, everything! I'm your number one fan! Helen: I'm calling to celebrate a momentous occasion. We are now officially moved in. Helen: Because I finally unpacked the last box. Now it's official! Ha ha ha! Why do we have so much junk? Helen: [picking something off Bob's shoulder] Is this rubble? Bob: [mouth is full of a huge piece of cake] It was just a little workout, just to stay loose. Helen: You know how I feel about that, Bob, darn you, we can't blow cover again! Bob: The building was coming down anyway. Helen: What? You knocked down a building? Bob: It was on fire. Structurally unsound. It was coming down anyway. Helen: Dash, do have something you want to tell your father about school? Bob: [Not paying attention] Good, good. Helen: No, Bob. That's bad. Helen: He put a tack on the teacher's chair. During class. Dash: Nobody saw me. You could barely see it on the tape. Bob: They caught you on tape and you still got away with it? Whoa! You must have been booking! How fast do you think you were going? Elastigirl: This is the right hangar, but I don't see any jets. Mr. Incredible: A jet's not fast enough. Elastigirl: What's faster than a jet? Dash: Hey, how about a rocket? Elastigirl: Great. I can't fly a rocket. Violet: You don't have to. Use the coordinates from the last launch. Mr. Incredible: Oh, wait. I bet Syndrome's changed the password by now. How do I get into the computer? Mirage: [Over PA system] Say please. Mr. Incredible: I should have told you I was fired, I admit it. But I didn't want you to worry. Elastigirl: You didn't want me to worry? And now we're running for our lives through some godforsaken jungle? Mr. Incredible: [grinning happily] You keep trying to pick a fight, but I'm still just happy you're alive.